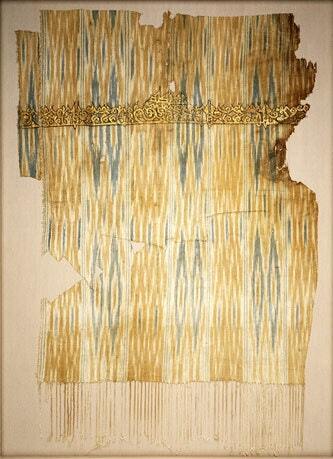 Mid 11th century ikat fragment found in Fustat, Egypt. Arrenging the dyed threads on the loom before weaving. Ikat is an Indonesian word, which depending on context, can be the nouns: cord, thread, knot and the finished ikat fabric as well as the verbs "to tie" or "to bind". It is a dyeing technique used to pattern textiles that includes resist dyeing the yarns prior to weaving the fabric. It is probably one of the oldest forms of textile innovations. 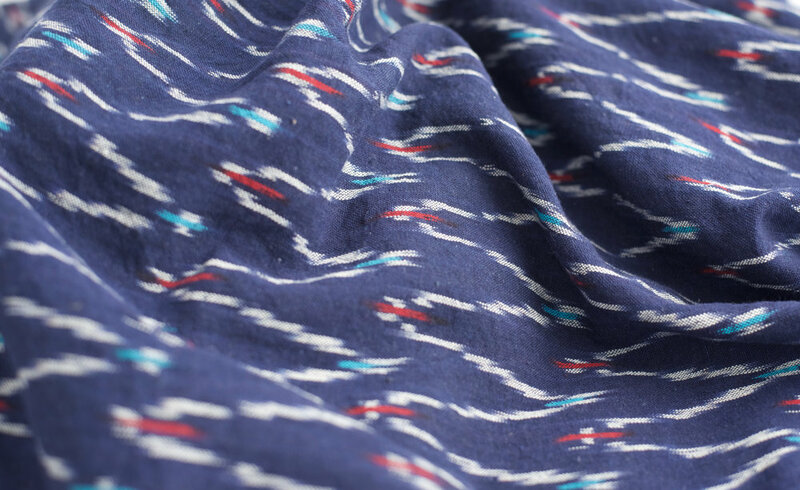 One of the earliest fabric samples using this style of weaving, dates back to ancient Egyptian civilisation. India and Southeast Asia are the geographical regions with the greatest diversity of ikat weaving, with all three technical versions present and developed to an unrivalled variety of designs. In India, Telangana, Odisha, and Gujarat are best known for their ikat traditions. To quote Judith Livingstone’s description of ikat’s multiple cultural connotations, these fabrics ‘have been worn as costume, exchanged as gifts, acquired as items of status and prestige, utilized for ceremonial and ritual purposes. They have also served as a medium of communication between members of social groups, as much as between the physical and spiritual world’. Bundles of yarn are tightly wrapped together and then dyed as many times as is required to create the desired pattern. To keep dyes from penetrating, the tightly bound bundles are covered with wax. Once the yarns have been suitably dyed and dried, the weaver lines them up on the loom to form the pattern. The design takes form as the yarn is woven into cloth. Designs are often worked out on graph paper before the weaving process begins. The natural movement during the weaving process gives the designs a feathered edge, which is the highlight of this technique. Producing elaborate and rich quality ikat involves an essential skill of spinning. It’s an incredibly complicated process, as the weaver has to precisely dye the threads, and place them carefully so it forms the correct pattern when woven. It’s an art that requires great skill, precision as well as patience and knowledge that has been passed down many generations. 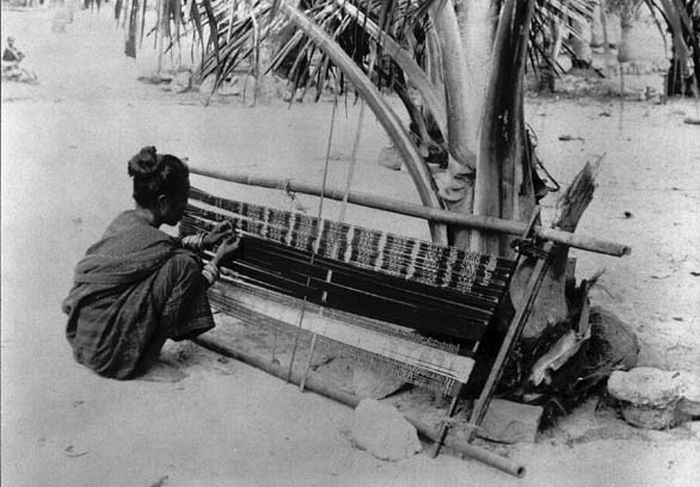 There are three different Ikat weaving techniques. Warp Ikat: In warp ikat, the weft yarns are all dyed a solid colour and only the warp yarns are ikat dyed. Here, the pattern is clearly visible when the threads are wound on the loom, and weaving in the weft threads solidifies the colour and completes the fabric formation. Weft Ikat: In weft ikat, it is the weft threads that are ikat dyed. This type of weaving is more difficult than warp ikat, as the pattern will be formed only as the weaving progresses. This means that the weaver has to constantly centre and readjust the yarns to ensure the pattern is formed correctly. Double-Ikat: The most complicated of the three, double ikat, is where both the warp and weft threads are resist-dyed prior to weaving. This technique requires advanced skill, takes time and hence is the most expensive. The Pochampally and Puttapaka ikats are native to India, and feature exquisite double ikat motifs. Fashion trends may come and go, but ikat fabrics have always stood the test of time. The graphic and geometric patterns that this weave embodies, makes ikat still fresh as ever despite it’s ancient roots. An original ikat can be easily recognised from the faux printed ones, by either looking up close, or simply turning the fabric over. Since ikats are woven on looms, you can be certain that it is a genuine ikat if the same design is on the inside of the fabric as well. Hand crafted arts cannot be replaced by machine made goods because the spirit is part of the craft.